Form Description: Whenever you work on a large project, such as rebuilding a car, adding an addition to a home, or something similar, people often like to know exactly where their money goes. If you are in a business where people ask for such information, then you really should take advantage of this Cost Breakdown Form. With it in hand you can easily list each of the subprojects you had to undertake, how much that portion cost, and even give a brief explanation of what was done. At the bottom of the form is a self calculating total as well. 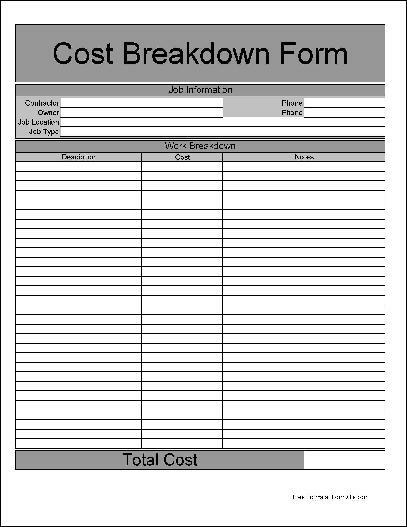 You can download a PDF version of the "Basic Cost Breakdown Form" form absolutely free. You can also, for a small payment, download a fully editable version of the form that you can customize as you desire. (Don't know which format to choose? Here's how to make your choice.) What would you like to do? Formville's free "Basic Cost Breakdown Form" form is associated with the following keywords: cost, bill, billing, total, breakdown, self calculating, projects, tracking, service, basic.